Know what will kill your joy in life every time? But know what can set you up for a lifetime of satisfaction? One might infer from this that the secret to happiness lies in figuring out how to get your expectations met. Makes sense, right? Except for this one itsy bitsy teeny weeny problem: you can’t always get your expectations met. Too many variables lie outside your control. And you want to know where this reality hits hard? Whoa Nelly! Now there’s a relationship where many expectations not only go unmet, but are lost at sea. If you’re a wise individual, who doesn’t want unmet expectations sinking the “love boat” of your future marriage, what are you to do? That’s where this little secret to happiness comes into play: setting realistic expectations. Well, first you have to recognize what your expectations are. You see, more often than not, we aren’t aware of our expectations until they’re not met. And again, there’s no other place where this is more of a reality than in marriage. But though they be unidentified, most people have big – and I mean BIG – aspirations for what marriage will do for them. Expectations so large and in charge that, if lovers accurately understood what the other was expecting of them they’d never agree to marry. But they don’t fully realize them, much less articulate them, so they do marry. This set up all but dooms a bride and groom to a life of disappointment. In fact, it might remind you of one or more marriages you know personally. And probably a couple divorces. 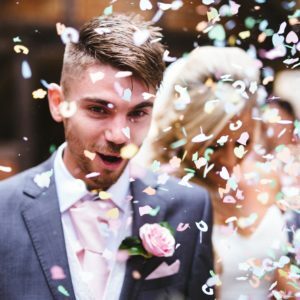 Instead of identifying, analyzing and then clearly communicating their expectations, so they can make an informed, conscious decision to either marry or part ways, many couples avoid the marriage decision all together. They choose instead to date indefinitely, often slipping into sleeping together, eventually on a regular basis, and maybe if the relationship lasts long enough, “making it official” by cohabiting. The idea is, if you never marry you never risk being disappointed by marriage. Eureka! Problem solved! But inevitably they find themselves disappointed in relationships anyway. Devastated even, by expectations never met by their partner, most which they never fully understood themselves. Better to find out before you start dating. Or at least before you fall in love. Now’s the time to identify them and understand them. Then you can pursue a dating life more likely to lead to a life-giving marriage like the one I enjoy with my wife of almost 25 years. Sound like a series worth following? Then come back next week and we’ll get started, but we’d love to hear from you first! If you had to identify a unrealistic expectation for marriage, something marriage vows cannot vow, what one would you identify? We’ll share our first one next week, but in the meantime, I encourage you to check out this past DNA post on marriage expectations: Marriage: Do Your Expectations Make Sense? And grow further in relational health by checking out our Hot Topic page dedicated to healthy relationships.